This species forms a large size (22 inches high by 50 inches wide) mound with shiny, dark green, heart shaped foliage. The medium purple, bell-shaped flowers with purple anthers are borne in July. The flower scapes may have faint red on them and bear a single bract about half way up. According to The Hostapedia by Mark Zilis (2009), this is "...one of the three hosta species known to be native to China (H. plantaginea and H. 'Lancifolia' being the others)..."
In terms of propagation of this plant, Mark Zilis (2000) continues on page 495, "One unusual characteristic of H. ventricosa is the formation of asexual (apomictic) seedlings. The flowers need to be fertilized for seed formation to occur, but instead of just developing a single, sexually produced embryo like all other hostas, multiple embryos, asexual in nature, develop out of endosperm tissue in the seed..."
"...The asexual seedlings are genetically identical to the mother plant, meaning that H. ventricosa can be clonally propagated by seed with the caveat that an occasional seedling (from the sexually produced embryo) will be different." 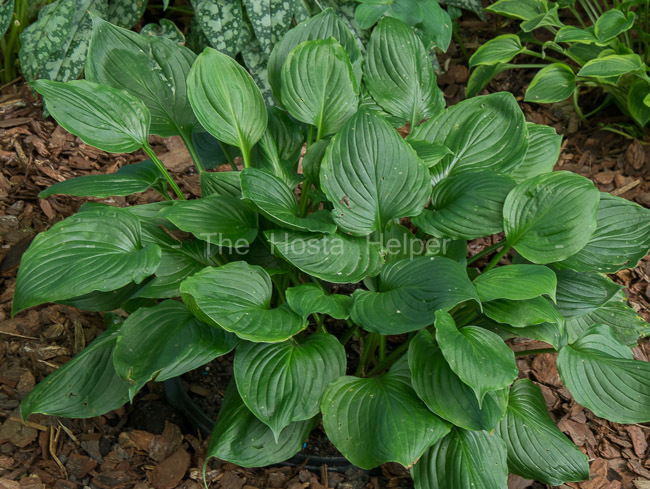 The New Encyclopedia of Hostas by Diana Grenfell (2009) states: "A naturally occurring tetraploid. The only hosta known to come true from seed. Seeds are produced without fertilization by a process known as apomixis. Can be used in breeding as a pollen plant, however, and is the parent of many piecrust-leaved introductions. The very thin leaves can scorch at the edges in warmer climates, even if grown in full shade. Flowers do not begin to open until the scape is fully extended." Mark Zilis (2009) says, "H. 'Borsch 3' or H. 'Borsch #3' = H. ventricosa". Also, this plant may have been sold at one time as Mackwoods No. 7. An article about H. ventricosa 'Aureo-maculata' and 'Aureo-marginata' by W. George Schmid in The Hosta Journal (1985 Vol. 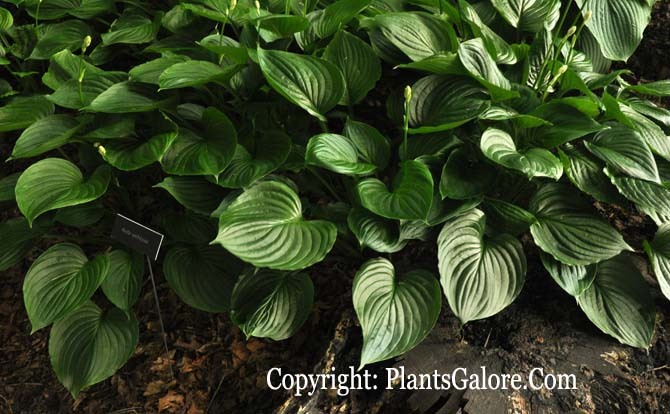 16) states that, "H. ventricosa is one of the oldest hostas in cultivation...The variegated form of H. ventricosa that is now identified with the cultivar name of 'Aureo-marculata' can be traced back to P.F. von Siebold's time. In 1876, E. Regel published a paper on hostas in Germany and in it referred to a "Funkia ovata forma aureovariegata. "...as a possible synonym for 'Aureo-maculata' form." Note: Nomenclature changes recommended in the 1991 book The Genus Hosta by W. George Schmid and accepted by The American Hosta Society would update names as follows: H. ventricosa 'Aureomaculata' and H. ventricosa 'Aureomarginata'. W. George Schmid in The Hosta Journal (1985 Vol. 16) continues, "In 1969, when I first started hybridizing experiments with H. ventricosa I concentrated on this species, because it was very fertile and always gave a good crop of seedlings. Yet, all I ever got was more H. ventricosa ...a plant showing pseudogamous apomixis....apomixis means modification of the normal sexual process...pseudogamy (from the Greek "pseudo" = false, and "gamy" = sexual union)...It really is vegetative propagation by way of seeds and means that this hosta cannot produce a cross as a pod parent...H. ventricosa as a pollen parent will produce hybrids." Talking about hybridizing in The Hosta Journal (1996 Vol. 27 No. 1), Tony Avent gives the following comments on cultivars he has introduced: "H. 'Waving Wuffles' - seedling of H. ventricosa with much narrower leaves and incredible ruffling...the clump gets much better with age!" Steve Chamberlain in The Hosta Journal (2014 Vol. 45 No. 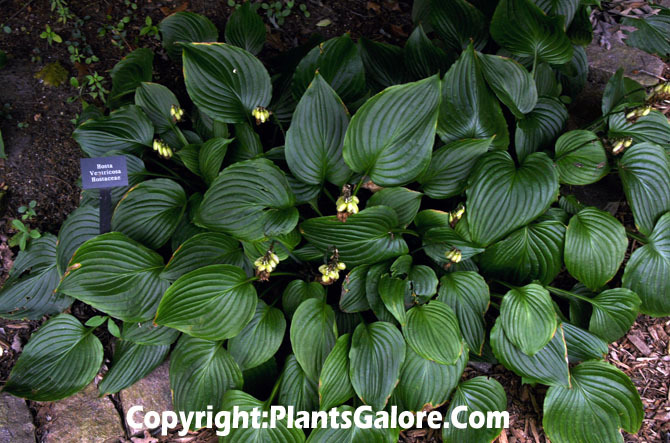 2) states that, "Of the species in genus Hosta, there is only one natural tetraploid -- H. ventricosa. This species and its garden sports...are good garden plants with large flowers and seed pods. The species comes true from seed, although its pollen has been used to produce hybrids. It is likely that H. ventricosa embodies one of the benefits of being tetraploid -- the substitution of asexual for sexual reproduction."